(Transcript from Hale Survey) Recorded in the Hale as unable to read stone. These gravestones all in a row are all of the children of Benadam Gallup and his wife Hannah Avery who all died of Typhoid Fever (from the CDC's Web site) within 10 years of each other. All information is from the 2009 Gallup genealogy page 93. This is gravestone #63. Lois was the ninth child born to Benadam and Hannah. 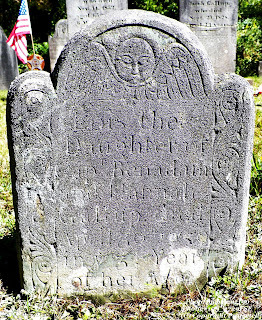 Born in 1756, she died on 30 Apr 1770 of typhoid fever at the age of three.